Druid denotes the priestly class in ancient Celtic societies, which existed through much of Western Europe north of the Alps and in Britain until they were supplanted by Roman government and, later, Christianity. Druidic practices were part of the culture of the tribal peoples called "Celtae" and "Galli" by Romans, which evolved into modern English "Celtic" and "Gaulish." The Druids were polytheists who also revered elements of nature, such as the sun, the moon, and the stars, looking to them for "signs and seasons." They also venerated other natural elements, such as the oak, certain groves of trees, tops of hills, streams, lakes, and even plants, especially mistletoe and holly. Fire was regarded as a symbol of several divinities and was associated with the sun and cleansing. Their calendar year was governed by the lunar, solar, vegetative and herding cycles. The four main holidays include Imbolc (Imbolg) to denote the first signs of spring, Beltane (Beltain) to recognize the fullness of life after spring, Lughnasadh to celebrate the ripening of first fruits and the many-skilled deity Lugh, and Samhain to recognize the end of harvest and the lowering of the barrier between the world of the living and that of the dead. The Druids' influence was as much social as religious. They not only performed roles similar to modern priests, but were often the philosophers, scientists, lore-masters, teachers, judges, and counselors to the kings. They were suppressed in Gaul and Britain after the Roman conquests, but retained their influence in Ireland until the coming of Christianity. Some traditional druidic religious practice may still survive in practices like decorated Christmas trees, Halloween observances, corn dollies, harvest rituals, and "lucky" or "unlucky" plants or animals. In modern times, Imbolc has been transformed into Groundhog Day, elements of Beltane have been absorbed into Easter, and Samhain has become Halloween. Modern attempts at reconstructing or reinventing Druidism are called Neo-druidism. 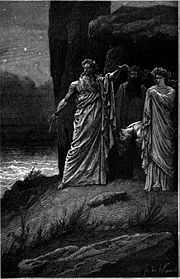 The earliest records of the name Druidae (Δρυΐδαι) are found on the works of Greek writers such as Sotion of Alexandria, who was cited by Diogenes Laertius in the second century B.C.E. The word "Druid" is derived from the Latin druides and is associated traditionally with drus, meaning "oak tree," together with the suffix -ides meaning "the son of." Greek and Latin "druides" bear comparison with Old Irish druídecht, which yields the Modern Irish draoiocht (pron. /'driː.oxt/), "magic." The Welsh dryw (/drɨu/ meaning seer) may also be related to these words. Some research done on the ancient Indian scripture Rig Veda, suggests a parallel between the Druids and the Druhyus referred therein. This may represent a common Proto-Indo-European religious heritage for the tradition. Historical knowledge of Druids is very limited, for they left no written records. Druidic lore reportedly consisted of a large number of verses learned by heart and it has been claimed that 20 years were required to complete the course of study. There was an advanced Druidic teaching center at Anglesey (Ynys Môn) centered on supposedly magical lakes. Druids came there from all over Europe to learn their secrets, but what was taught there, or at other centers, is conjecture. Of the Druids' oral literature (sacred songs, formulas for prayers and incantations, and rules of divination and magic), not one verse has survived, even in translation. Nor is there even a legend that can be called purely Druidic, without a Roman and/or Christian overlay or interpretation. Julius Caesar's Commentarii de Bello Gallico gives the fullest account of the Druids. Caesar notes that all men of any rank and dignity in Gaul were included either among the Druids or among the nobles, indicating that they formed two classes. The Druids constituted the learned priestly class. As guardians of the unwritten ancient customary law they had the power of executing judgments, among which exclusion from society was the most dreaded. Druids were not a hereditary caste, but they enjoyed exemption from military service as well as from payment of taxes. The course of training to which a novice had to submit was protracted. All Druidic instruction was communicated orally, but Caesar reports that for ordinary purposes, the Gauls had a written language in which they used Greek characters. However by the time of Caesar, Gaulish had moved from the Greek to the Latin script. Caesar noted that Druids punished members of the society by a form of excommunication, preventing them from attending religious festivals. As these religious festivals were common and well-attended, this was an effective means of excluding punished persons from society. Cicero (106-43 B.C.E.) remarks on the existence among the Gauls of augurs or soothsayers, known by the name of Druids, saying that he had made the acquaintance of one Diviciacus, an Aeduan also known to Caesar. Writers such as Diodorus and Strabo, though with less firsthand experience than Caesar, reported that the Celtic priestly order or class included Druids, Bardism and Vates (soothsayers). It was also claimed by Roman writers that a general assembly of the order was held once every year within the territories of the Carnutes in Gaul. Pomponius Mela (c. 43 C.E.) is the first author who says that the Druids' instruction was secret, carried on in caves and forests. Human sacrifice has also sometimes been attributed to Druidism. While some see this as Roman propaganda, human sacrifice was an old European inheritance. Executions may also have been conducted as sacrifices, whether of criminals or, to judge from Roman reports, of war captives. Diodorus Siculus asserts that a sacrifice acceptable to the Celtic gods had to be attended by a Druid, for they were the intermediaries. He also claims that before a battle the Druids often threw themselves between two armies to bring about peace. Diodorus remarks upon the importance of prophets in Druidic ritual: "These men predict the future by observing the flight and calls of birds and by the sacrifice of holy animals: all orders of society are in their power… In very important matters they prepare a human victim, plunging a dagger into his chest; by observing the way his limbs convulse as he falls and the gushing of his blood, they are able to read the future." These comments are supported to some extent by archaeological excavations. At Ribemont in Picardy, France, there were revealed pits filled with human bones and thigh bones deliberately fixed into rectangular patterns. At a bog in Lindow, Cheshire, England was discovered a body which may also have been the victim of a druidic ritual, but it is just as likely that he was an executed criminal. The body is now on display at the British Museum, London. 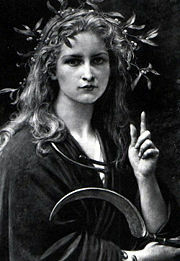 Druids were seen as essentially non-Roman. A prescript of Augustus forbade Roman citizens to practice druidical rites. Under Tiberius the Druids were suppressed by a decree of the Senate, but this had to be renewed by Claudius in 54 C.E. After the first century C.E. the continental Druids disappeared entirely from the historical record and were referred to only on very rare occasions. Druids continued to be a presence in the British Isles, however, for several centuries. The story of Vortigern as reported by Nennius provides one of the very few glimpses of Druidic survival in Britain after the Roman conquest: unfortunately, Nennius is noted for mixing fact and legend in such a way that it is now impossible to know the truth behind his text. He asserts that, after being excommunicated by Germanus, the British leader Vortigern invited 12 Druids to assist him. In Irish literature, the Druids are frequently mentioned, and their functions in the island seem to correspond fairly well to those they performed in Gaul. The most important Irish documents are contained in manuscripts of the twelfth century, but many of the texts themselves go back as far as the eighth. In these stories Druids usually act as advisers to kings. They were said to have the ability to foretell the future (Bec mac Dé, for example, predicted the death of Diarmait mac Cerbaill more accurately than three Christian saints, but there is little reference to their religious function. They do not appear to form any corporate body, nor do they seem to be exempt from military service. In the Ulster Cycle, Cathbad, chief Druid at the court of Conchobar, king of Ulster, is accompanied by a number of youths who are desirous of learning his art. Cathbad is present at the birth of the famous tragic heroine Deirdre. He prophesies what sort of a woman she will be and predicts the strife that will accompany her, although Conchobar ignores him. Before setting out on the great expedition against Ulster in Táin Bó Cuailnge, Medb, queen of Connacht, consults her Druids regarding the outcome of the war. They hold up the march by two weeks, waiting for an auspicious omen. Druids were also said to have magical skills: when the hero Cúchulainn returned from the land of the fairies after having been enticed there by a fairy woman or goddess, named Fand, whom he is now unable to forget, he is given a potion by some Druids, which banishes all memory of his recent adventures and which also rids his wife Emer of the pangs of jealousy. More remarkable still is the story of Étaín. This lady, later the wife of Eochaid Airem, High King of Ireland, was in a former existence the beloved of the god Midir, who again seeks her love and carries her off. The king has recourse to his Druid, Dalgn, who requires a whole year to discover the haunt of the couple. This he accomplished by means of four wands of yew inscribed with ogham characters. In other texts the Druids are able to produce insanity. Mug Ruith, a legendary druid of Munster, wore a hornless bull's hide and an elaborate feathered headdress and had the ability to fly and conjure storms it was said. In the lives of saints and martyrs, the Druids are represented as magicians and diviners. In Adamnan's vita of Columba, two of them act as tutors to the daughters of Lóegaire mac Néill, the High King, at the coming of Saint Patrick. They are represented as endeavoring to prevent the progress of Patrick and Saint Columba by raising clouds and mist. Before the battle of Culdremne (561 C.E.) a Druid made an airbe drtiad (fence of protection) round one of the armies, but what is precisely meant by the phrase is unclear. The Irish Druids seem to have had a peculiar tonsure. There is some evidence that the Druids of Ireland survived into the mid- to late-seventh century. In the De Mirabilibus Sacrae Scripturae of Augustinus Hibernicus, there is mention of local magi who taught a doctrine of reincarnation in the form of birds. The people of the Low Countries were Christianized in the seventh century, through the efforts of Saint Eligius. One of the best glimpses of late Druidic practices comes from the vita of Eligius written by Saint Ouen, his contemporary and companion. Ouen reports that Eligius denounced "sacrilegious pagan customs" in Flanders. In particular, he denounces the consultation of "magicians, diviners, sorcerers or incantators," auguries, and superstitions related to the moon. He refers to "devotion to the gods of the trivium, where three roads meet, or the rocks or springs or groves or corners" as idolatrous customs, and he frowns on Yule Midsummer celebrations. Other pagan customs enumerated by Eligius include "lustrations or incantations with herbs" and "passing cattle through a hollow tree or ditch" and "shouting when the moon is obscured" and adoration of or swearing by the sun or moon, and "diabolical games and dancing or chants." Hill of Tara in County Meath, Ireland, legendary seat of the High Kings. The association of Druids with Stonehenge was hypothesized in the sixteenth century in attempts to explain the mysteries of Stonehenge, a prehistoric monument that was abandoned long before any Druids came to Britain. There is no evidence that it was ever used by authentic Druids in ancient times. Nevertheless, it has become an important site for modern movements calling themselves druidic. A Victorian imagining of a Druidess, with sickle and misteltoe. In the eighteenth century, England and Wales experienced a revival of interest in the Druids, inspired by the antiquaries John Aubrey, John Toland and William Stukeley. The poet William Blake was involved in the revival and may have been an Archdruid; the Ancient Druid Order, which existed from 1717 until it split into two groups in 1964, never used the title "Archdruid" for any member, but credited Blake as having been its Chosen Chief from 1799 to 1827. 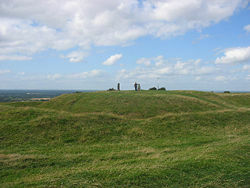 John Aubrey was the first modern writer to connect Stonehenge and other megalithic monuments with Druidry, a belief that shaped ideas of Druidry during much of the nineteenth century. John Toland, founder of "neo-Pantheism, was fascinated by Aubrey's Stonehenge theories and founded the Ancient Druid Order in London in 1717. Druids began to figure widely in popular culture with the first advent of Romanticism. Chateaubriand's novel Les Martyrs (1809) narrated the doomed love of a Druid priestess and a Roman soldier; though Chateaubriand's theme was the triumph of Christianity over pagan Druids, the setting was to continue to bear fruit. Opera provides a barometer of well-informed popular European culture in the early ninteeenth century: in 1817, Giovanni Pacini brought Druids to the stage in Trieste with an opera to a libretto by Felice Romani about a Druid priestess, La Sacerdotessa d'Irminsul ("The Priestess of Irminsul"). The most famous Druidic opera, Bellini's Norma was a fiasco at La Scala, when it premiered the day after Christmas, 1831, but in 1833 it was a hit in London. For its libretto Felice Romani reused some of the pseudo-Druidical background of La Sacerdotessa to provide color to a standard theatrical conflict of love and duty that was related to Medea, as it had recently been recast for a popular Parisian play by Alexandre Soumet: the diva of Norma's hit aria, "Casta Diva," is the moon goddess, being worshipped in the "grove of the Irmin statue." In the nineteenth century, Edward Williams, also known as Iolo Morganwg, supposedly collected The Iolo Manuscripts (1849) and Barddas (1862). Many scholars deem much of Williams' work to be fabrication. Some strands of modern "Druidism" (also known among some groups as Modern Druidry), such as the Order of Bards, Ovates, and Druids (OBOD), are a continuation of the eighteenth-century revival and thus are built largely around writings produced in the eighteenth century and later. Some are monotheistic. Members of other Neo-druid groups may be Neopagan, occultist, Reconstructionist, or non-specifically spiritual. ↑ Diogenes Laertius, Lives and Opinions of Eminent Philosophers Introduction, Chapters  & 5. classicpersuasion.org. (Book A 1 & 6 (greek text). www.mikrosapoplous.gr. All retrieved October 18, 2007. ↑ Augustinus Hibernicus. "De Mirabilibus Sacrae Scripturae." King of Mysteries: Early Irish Religious Writings edited by John Carey. Dublin: Four Courts Press, 2000. ↑ Druids www.thebritishmuseum.ac.uk. Retrieved October 16, 2007. This page was last modified on 9 October 2017, at 21:20.